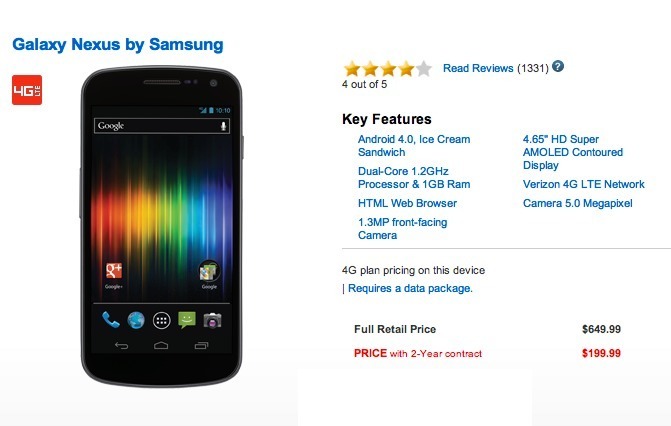 We received word on Friday that the Galaxy Nexus would drop to $199 on-contract at Verizon shops and sure enough, it has. If you head into stores or go online, you can pick up VZW’s best Android phone for this new price. Remember though, you will be charged an additional $30 through their newly activated upgrade fee that went live yesterday. You should still be able to find this phone for even lower prices at other online retailers or big box stores, but remember that those come with rules and guidelines a lot of the time. What I’m trying to say is, be careful. Many of the online retailers force you to keep the phone on the same line for 181 days and not change a thing about your plan or features or they charge you the full retail price of the device without warning. Fine print, folks.